Choosing a new printer can be a daunting task. With some many brands and styles on the market, it is difficult to determine which printer will not only provide you with the best, reliable, most cost-effective service but also which one will meet all of the needs of your office or company. To make your decision easy, follow the tips below to help by the purchase your new printer. One of the first things to decide on when shopping for a new printer is to identify which type of printer will best fit your company needs. Do you want a standard printer or one that has multi-functions such as scanning, copying, or faxing ability? 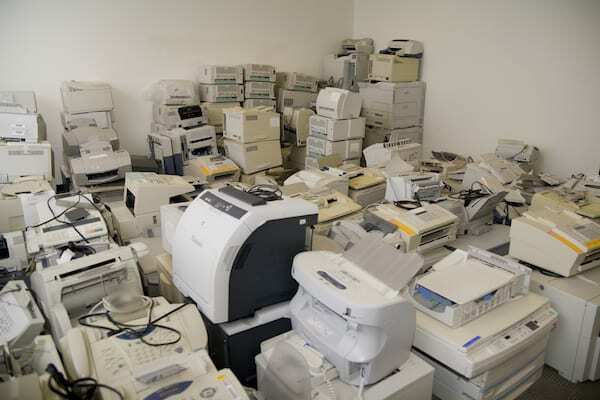 Additionally, you will want to determine whether you prefer a laser printer or an inkjet. If your end goal is speed, a laser printer may be the best choice for you. If speed is not a concern, an ink-jet may serve your purpose. While you will not have to have the exact amount you want to spend, you should come up with either a budget range or a maximum that you can spend to replace the printer. Printers can range from under $100 to over $1000, so coming up with a basic price range will help you narrow down your options to be able to stay within your desired budget. Are you looking for a printer that will be utilized for internal forms or letters, or are you looking for one to produce higher quality materials that can be used for presentations or marketing? Your primary use will help you determine the quality level that you will need to be able to achieve. Do you have a brand preference? If you have brand consistency throughout your office, it can sometimes be easier to continue with the same brand of the printer if you have had good experience with them in the past. Having the same brands across your office can make supply purchasing easier and limit the number of vendors. After narrowing down your choices, you will have just a few more steps to your new printer purchase completion. Calculate the Overall Operating Costs -After deciding on a top few, you can calculate the overall operating costs of the printer choices to help aid you in your final decision. To determine the operating costs, you will need to take into account the cost of toner as well as any other supplies that will be part of the machine usage and required maintenance such as drum kits. Sometimes these costs can range significantly from machine to machine so operating costs may play a major role in your final decision. Make Your Purchase – Once you have calculated all your costs and decided which printer will work best to fit your needs and the needs of your office, it is time to make your purchase. Depending on the value of the printer it may be prudent to purchase warranties that are available if they are reasonably priced. Again this should be based on the value of the printer. Less expensive printers typically do not make the warranty worth while. Be sure to purchase any supplies or cords that are needed for setup that might not be included. You will also want to purchase at least one additional toner as the toner that comes with the printer is not completely filled. Set Up Your Managed Print Services – Once you have made your purchase, you can set up managed print services for all the printers in your office or business. By setting up managed services, you can take the hassle out of printer maintenance, repair, and supply ordering. Not only will you be able to save time, but you will also have a more accurate snapshot of your printing costs as managed print services can provide you with a per piece price to help manage your budget and see where your printing expenses are. If you would like more information on managed print services or would like an assessment of your office contact the experienced professionals at Atlantic Business Systems today.